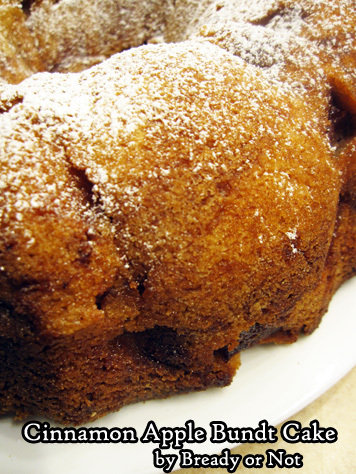 This bundt cake is tender and moist, with chunks of apples throughout. Eat it hot or cold, or freeze some slices for later! Preheat oven to 350-degrees. Grease and flour a bundt cake pan. In a large bowl, stir cinnamon to coat the chopped apples. Set aside. In another big bowl, beat together sugar, oil, eggs, and vanilla. Combine the flour, salt and baking powder in another bowl, then slowly add it into the liquid mixture. Stir in the apples. Pour the batter into the ready pan. Bake for 60 to 70 minutes, until it passes the toothpick test. Let cool in pan for 15 minutes, then carefully invert the cake out of the pan and onto a wire rack to completely cool. Keep stored in fridge. If desired, before serving, sift confectioners' sugar over the top. Slices may be eaten cold or warmed up in the microwave. Cake can also be frozen in slices for later enjoyment.